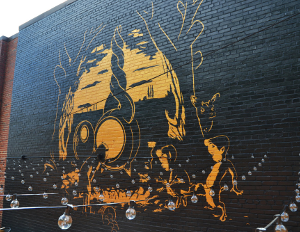 Public art has the power to transform mundane public spaces into dynamic canvases thatÂ make art accessible. These installations meet people where they are and bring imaginative thought into everyday life. Visual artist Nekisha Durrett usesÂ public art to provoke thought and bring smiles around the country. 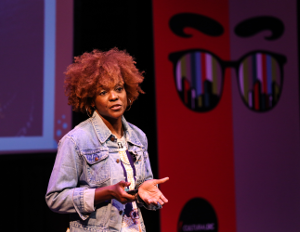 On April 24, 2017, Nekisha and five other artists pitched themselves to real-estate developers for the chance to create public art installations at the inaugural ART TANK in Washington, D.C. 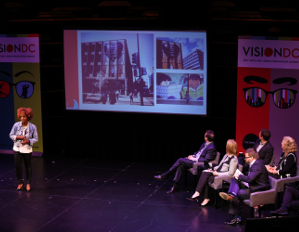 Organized as part of Cultural DC’sVision DC Summit, the first-of-its-kind event brought artists and real-estate developers together to negotiate the development of public art projects live on-stage. Each artist had three minutes to pitch themselves to a panel of real-estate developers including Ditto. Development, Foulger-Pratt Development, artspace, Urban Atlantic, ABDO Development, and Forest City Washington. 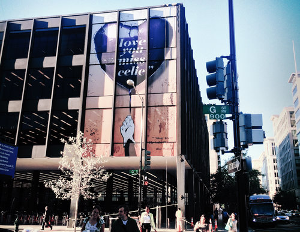 These developers are building multimillion-dollar projects in and around the nation’s capital. Following each pitch, the real-estate developers engaged the artists in a Q&AÂ session before deciding to make a bid to secure the artists’ services for their upcoming projects. Nekisha Durrett uses a variety of mediums including construction mesh, adhesive vinyl, window film, die-cut acrylic, and traditional painting to create massive graphic drawings. At ART TANK, Durrett struck deals with two real-estate developers. After the event, Brandon Andrews sat down with her to discuss the business of public art and her thoughts on the event. You create large-scale graphic drawings that transform spaces. How did you decide on this approach? In a former life, I worked in graphic production for the Smithsonian–large format printing, large-scale photo murals and text panels for museum exhibitions. Working consistently at such a large scale and observing how oversized graphics deepened the engagement of museum visitors’ experiences in exhibitions, left an indelible mark on me. At the same time, having previously been a student of typography and graphic design, I was interested in the aesthetics and messaging of advertising. I looked to commercial media and popular media (some of it good, some of it bad) and admired how accessible it is to people from all walks of life. I grew curious about how my art practice could integrate with commercial production, advertising, and public display. While I value and appreciate showing in gallery spaces, I find that they can sometimes be inaccessible or intimidating. I love the way that art in public spaces offers the opportunity for anyone to engage with art and how it dissolves the imaginary wall between art and day-to-day life. 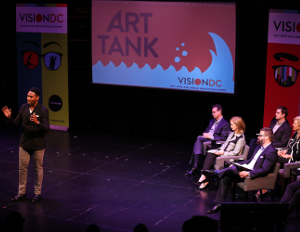 You pitched at CulturalDC’s ART TANK event. Tell us about your experience. So, public speaking is something that I am working on–like, really really working on. The physical act of making my work is pretty solitary so to get on stage in front of hundreds of people and talk about what I do does not come naturally. Usually, when pitching an idea in “real life,â€ it’s just me and one, maybe two other people. When I tell you that I looked for the exit door backstage moments before showtime, I am not kidding. Did you learn anything about the business of art as you prepared for the event? I think the preparation for Art Tank reiterated a lesson that I didn’t fully accept until recent years. In my life, the most fruitful experiences have come from pushing myself beyond my comfort zone. I could sit in my studio day in and day out and make work that only I would see for the rest of my days and I’d probably be OK. I wouldn’t starve. No one would ever reject me or my work. I wouldn’t be humiliated. To push myself beyond the feeling of being safe and OK has been terrifying, painful, disappointing–but the richest experiences I’ve had in my life to date occurred on the other side of that trepidation. I could be OK but I could also take a risk and be fabulous. Why is there friction between creative entrepreneurs–including artists–and the business world? I can only speak for myself as an artist: I’m not sure that I would use the word “friction.â€ I would consider it to be more of a disconnect. I lament over this with artists all of the time. I think the messaging about how art is undervalued in our culture is absorbed very early on–by both artists and business people. The insecurity this invokes makes it difficult for an artist to demand what they are worth, and nonartists can be completely clueless about the resources that go into making work so they have no idea what it’s worth–both culturally and monetarily. It’s very frustrating to work with people who don’t understand the value of what you do in any profession. I’ve been very fortunate to work with a number of business-minded people who actually get it, but I’ve heard tales! I think there is a common misconception among nonartist/business types that artists are just sort of playing in the sandbox, having a good time, navel gazing. People say things like: “Oh fun! You’re so lucky! You get to do whatever you want! That must be so liberating.â€ Some of this is true. I know that I am privileged to be able to engage every day in something that I love, but being an artist can be excruciating! Oh, the number of times we are offered “exposureâ€ in exchange for blood, sweat, and tears! What resources do you think artists and creative entrepreneurs need to build better—more sustainable—businesses? As an art student many moons ago, there wasn’t a business course offering. From that and other subtle messages, I inferred that making money from art was not possible and to do so or to have a strategy to make money from art was to cheapen it. I sort of felt, after graduate school, that I would have to make a choice to make money or make art. It did not occur to me that there was a way for the two to exist in tandem, a way to turn this ability that I’ve been developing since childhood into a viable sustainable business. I think it’s important to know your worth, connect with other artists whom you respect for both their artistic practice and professionalism–intern with them, assist them, carry their stuff–and watch and learn. Know that it is difficult to build a successful business in a vacuum. No one is self-made! It’s so important to connect with people working not only in the arts but, in law, business, museums, etc., and grow relationships. People are the most valuable resource. You struck two deals with real estate developers at Art Tank. Congrats! What’s the next step in the development of your projects? I’m used to juggling multiple projects so the first step would be to assess the needs of each project and establish a realistic timeline so that everyone’s needs are met. 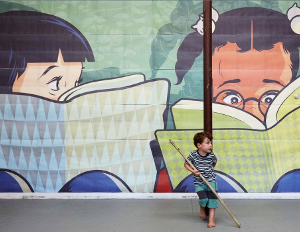 How can readers get in contact with you? Where can we see your current work? Brandon Andrews is a senior consultant at Values Partnerships. View his commentary on business and politics at www.brandonandrews.me.